The Royal British Legion had put up a bronze statue of a soldier in memory of all those from Tidworth who had fought and died in World War II. Unfortunately, with metal prices soaring, two men spent 40 minutes removing the statue one night, putting it in their car, likely to sell off as scrap metal. I’ve written about Mark Patterson’s vandalism of the Bizory monument before. There is some good news there: when I asked another visitor to check for the vandalism, they couldn’t find it, so it may either have been repaired or been worn down to unnoticeable levels after 18 months. Mark’s was at least trying to make a point with what he had done. This act makes that seem miniscule, but the problem is that when even those dedicated to preserving the memory of WWII feel free to disrespect the monuments, how can we expect the average person to hold them sacred? I worry for Gettysburg, where there are so many monuments and a history of damage and theft. Hat tip to Paul Woodadge for posting about it on Facebook. Why am I writing about the Bizory monument? On occasion, when I email or interview someone about the Bizory monument and Mark Patterson’s vandalism of it, they ask me why I’m bringing it up. Some of them simply want to forget about it. Some of them don’t want to harm Mark’s reputation. Some comment on how terrible it was, but state that they just want to put it behind them. Everyone finds the issue at least somewhat uncomfortable. ﻿At his request, I interviewed Mark in March. Mark pointed out to me that a number of veterans and others have been upset by the monument’s limited scope (only memorializing Easy Company), feeling that it serves as a slap in the face to those who actually fought in that spot. It’s not that they dislike the veterans of families of Easy Company, they just feel that all the attention is focused on them because of the book and HBO series. The typical protest has been the arrangement of small stones indicating the other units that actually fought there (like the 501st). Some folks have stated that they do that every time they visit it. I’m told that one 501st veteran even arranged stones to refer to Easy Company as “Sleazy Easy”. Obviously, we have a serious problem with the current monumentation. Mark contends that it would have been a simple matter to include those units on the Bizory monument or to have included D/506 on the Brecourt monument (the Brecourt monument memorializes some Easy Company men who did not fight at Brecourt and ignores D Company which did). While I don’t think they should be obligated to do so, it would have been wise. Notably, the Richard Winters Leadership Project, which will unveil a statue of the Easy Company commander in Sainte-Marie-du-Mont on the 2012 anniversary of D-Day, is more inclusive, stating that it is Dedicated to all U.S. Army junior officers who led the way on June 6, 1944. Since the damage to the monument is still there (not as evident as a year ago, but visible nonetheless), pretending it never happened isn’t going to work. People know something happened and that Mark was responsible, so if there is no record of it, but only a whispering campaign, his reputation will be in the trash anyway. So anyone who thinks ignoring it will make it go away is wrong. I get at least one search hit every day for information on this vandalism, though Mark tells me that he and a friend are the one hitting Google on a daily basis (some days I get several searches, other days, I get none). I’m going to continue writing about this as I learn more, because I think the best way to prevent these things from happening in the future is for people to know what happened and get some insight into the reasons. I think articles should be written for historical journals and magazines about this and about the problems with these monuments. Otherwise, the next frustrated person might go vandalize another monument. As a historian, I feel that the best course is always more information, not less. Well, I was able to get my good friend Brian to drive over from Luxembourg to Bizory this week and take new photos. The bad news is that the damage is still there and no likely to go away on its own. I’d seen the photo that showed the monument in July of last year (the damage had been done in May) and been told that it worn away by September. Sadly, nearly a year after the monument was damaged, the vandalism is still apparent. The lighting is a little different, so that may have something to do with the visibility of the markings, but they are still evident. One person told me that, if you know where to look you can find them, but if not, you wouldn’t notice. When Brian first got to the monument, he couldn’t figure out where the damage was, but when he re-read my email and went back, was able to find it and provide the photo. I’ve had a small breakthrough in my quest to learn more of what happened at Bizory and what the status is, but it has mostly prompted more questions for me and created a list of people I need to reach out for more information. I’m also going to be tasking a friend who lives in Luxembourg but isn’t involved in historical research or tours to visit the monument to get a photo, as there is no clarity yet on whether the damage persists or not. When you’re talking to a used car salesman and he doesn’t know the answer to one of your questions, you can be sure he’ll make something up. Better for him to confuse you and defuse your worries, or generate some fear, uncertainty and doubt than for him to deal with you honestly. After all, he just wants your money. Now, one hopes that when studying history, a higher standard will be exhibited by historians. Thomas P. Lowry committed fraud by altering a pardon authored by Abraham Lincoln so that it would read as having been signed on April 14, 1865 – the date of Lincoln’s assassination – instead of April 14, 1864. Lowry took a fountain pen with him into the National Archives and literally re-wrote history by changing 1864 to 1865. For his discovery, the amateur historian was popularly hailed, invited to speak at conferences and able to publish his work freely. I follow a few Civil War blogs and, while I’d read about it the Washington Post this morning, there is nothing quite like the collective ire of the community. David Woodbury’s of Battlefields and Bibliophiles quotes some of Lowry comments about the pardoned soldier, Patrick Murphy, in ways that likely will apply to people’s opinions of Lowry himself. Eric Wittenburg notes that this is stain on the historical community. Brooks Simpson offers some thoughts on how this could have gone unnoticed. To me, this falls in the same category as Mark Patterson’s vandalism of the Bizory monument or the hideous monuments to Longstreet in Gettysburg and to Peace in Normandy, only…. it’s far worse. He was literally altering the historical record and in pursuit of that one goal of all too many revisionists, fame. Historians seek truth. Lowry just wanted respect he hadn’t yet earned. Having noticed that the most consistent search terms that land people at my blog contain “Bizory monument” or “Mark Patterson”, I’ve been hunting for more information on the current status of the damage and potential for repairs. When I’ve got to various Airborne forums to search the old threads on it, they are sometimes already deleted (in forums that don’t seem to delete any threads) and without any updates, so I’ve started pinging all of my friends in Normandy and, now, hitting their friends in Belgium (I have them on Facebook, after all) to see if any current photos can be found. Marcus Brotherton offered to pass along my contact info to some folks as well, so I expect to be able to post a photo and provide an update within a week or so. 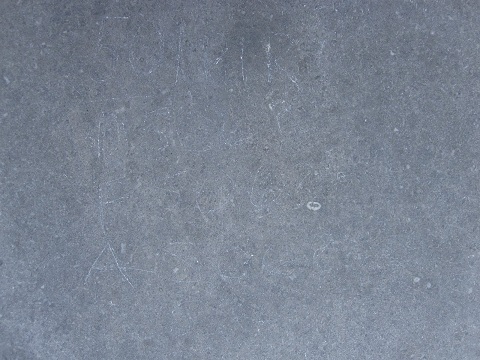 The initial word that I’m getting is that the vandalism is still visible, though in a photo from September it was apparently not as prominent as when initially damaged. 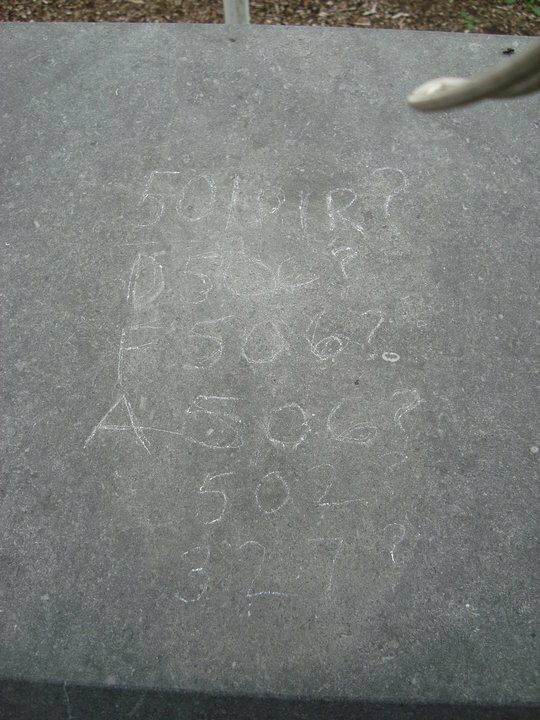 This summer, I learned that one of the monuments in Belgium was desecrated by someone who scratched on more unit designations, since it was a monument to only one company. Of course, since Band of Brothers brought so much fame to E/506, it has also generated some resentment, since anything for them is more easily funded and more widely known. It’s not hard to find people who either think that Easy Company was the best unit in the war, or those in the opposite camp, that think it despicable that the rest of the 101st Division or the rest of the Army gets so much less credit than these men. The individual who comitted the desecration falls into the latter camp and used to be the co-moderator of a forum on airborne history. This individual felt compelled to modify the monument because he didn’t agree with it (he has publicly apologized, for what that’s worth). I’ve run across this attitude before – people who feel compelled to change the monumentation on a battlefield to better suit themselves. I would say that it’s to better explain the battlefield, or commemorate the deeds of the warriors, or to somehow enhance the value of the battlefield, but my impression of these people is that it’s rarely about anything but themselves. In Gettysburg, the only Corps commander on either side who had no monument was General Longstreet. While it was odd and perhaps unfair, no monument had been made for the General while he was alive or in the early 20th century when the last veterans of the battle attended the last reunions. As such, to me, the lack of a monument to Longstreet was a story of the battlefield itself. Mentioning that he had no monument allowed one to explore why General Lee’s right hand wouldn’t have had a monument, leading to a discussion of reconstruction politics in the south, the relationship between Longstreet and Grant, as well as, perhaps, a discussion of the ‘Lost Cause’ movement. So, to me, the very fact that Longstreet had no monument was an integral part of the battlefield. However, a number of people worked very hard to get a monument built to General Longstreet. Unfortunately, they succeeded in putting up what some refer to as the ugliest monument on the battefield, taking away the interesting story about Longstreet not having a monument and replacing it with a story of how a bunch of hobbyists were able to band together and put up a monument to their hero. Longstreet had long been abused by the Lost Cause for a variety of invented reasons, but now, he has a monument on the greatest battlefield of the war. He must feel better! Except, he’s been dead a long time and the monument put him at ground level, on a diminuitive horse and his proportions look neither herioc, nor completely human. The artist also ensured that it would ‘violate’ the typical rules of military monumentation – often, the number of hooves off the ground on the horse is an indication of whether the rider was wounded or died in battle. (see note below on “folk wisdom”) At Gettysburg, all the equestrian monuments follow this guideline (there is no written rule) and it feels to me as though this was done because it was different and because it would stand out. So, we have a bunch of hobbyists working to make a name for themselves by putting up a monument and an artist who makes a silly-looking monument that defies convention, giving the impression he wants the monument to say something about the artist, more than something about Longstreet. So, for me, despite the fact it is nominally a monument to the man, all I can think about is the people who put it up. In Belgium, Mark Patterson wished to make a statement by scratching unit numbers onto the Easy Company monument in Bizory. While I think we all would agree that every unit that fought there deserves a monument, it happens that because of Band of Brothers, getting money to put up an Easy Company monument is probably simpler than putting up a monument to F/501. That said, scratching the numbers on a monument and letting people know you‘ve done it, and done it more than once, is not about recognition for those other men who fought there. If you wish to honor the others who fought there, gather money, get the veterans out and put up a monument to them. Walking around pretending to be the champion of the unrecognized heroes by desecrating Easy Company’s monument is not about honoring the other units, but entirely about one’s own image. Fortunately, almost everyone I’ve seen write about this finds his actions reprehensible. Sometimes, when listening or reading someone’s revisionist theories about a battle or a war, I also get the same impression. That it’s not about understanding, but rather about the speaker or author wanting you to notice that they have figured out something noone else has. They wish you to be dazzled by their brilliance, rather than being concerned with whether the theory actually matches with the evidence. Some of these theories are concocted by starting with a theory and then hunting down bits and pieces of evidence, sometimes out of context that support the theory. The worst cases require that you first ignore anything you know about tactics or strategy. If you want to see the opposite of these actions, check out the work of the Stoy’s (CPT Monika Stoy and COL Tim Stoy). This August, they again took money out of their own pockets to fund the commemoration of Operation Dragoon. This year, the conference ran for 3 days, with several authors giving talks and about 20 veterans attending. The Stoy’s also travel around Europe, working to get monuments to these warriors installed or repaired in small towns throughout France and Germany. Often, their work brings remembrance of a debt owed to these men, and the towns celebrate them. It doesn’t tear someone down to build someone else up, or attempt to draw attention to themselves. It’s about the veterans and about what they did. Note on “folk wisdom”: Check the comments for a discussion about the hooves on the Longstreet statue. Neither the Gettysburg Battlefield Monument Association nor any other organization has ever wrote any guidelines on the hooves in equestrian monuments. 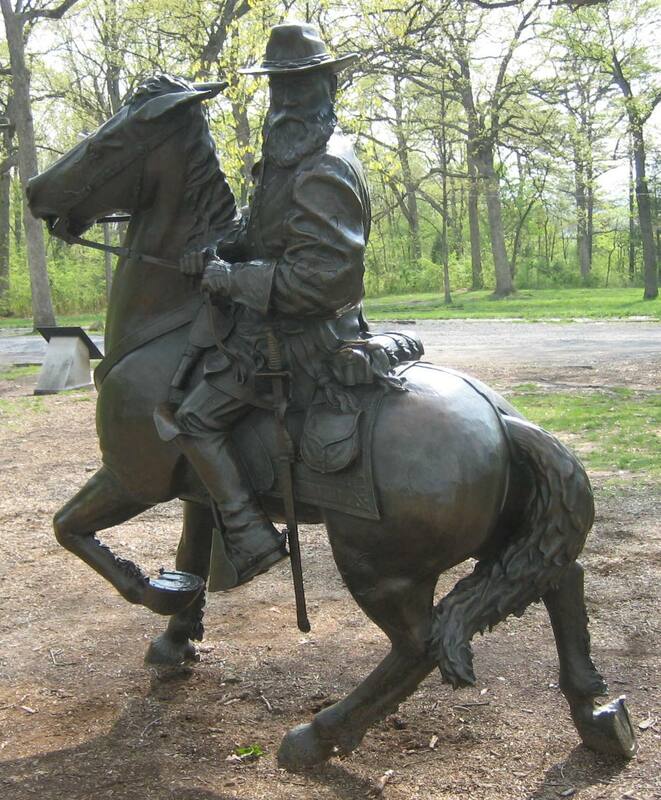 At Gettysburg, the hooves on the monuments do seem to represent the riders fate, but outside of Gettysburg, it is merely coincidental that sometimes this is the case. Check the Snopes article by Barbara Mikkelson for a good explanation of the failure of this “folk wisdom”. Thanks to Craig Swann for prompting the clarification.